Washington Capitals: Can Jakub Vrana Earn a Permanent Spot? Can Vrana Earn a Permanent Spot in Washington? Jakub Vrana is perhaps the Washington Capitals’ top forward prospect, but he hasn’t been able to fully adjust to the NHL level and become a permanent fixture in the lineup. That could change this season. The former 13th overall pick has taken the time to develop and transition to the North American game in three years with the AHL’s Hershey Bears, and with roster spots up for grabs this season, as well as an opening on the top-six left wing, the 21-year-old appears ready to make the jump and earn a full-time gig. However, there are steps he will have to take to guarantee a spot on the roster for the entire 82-game campaign. 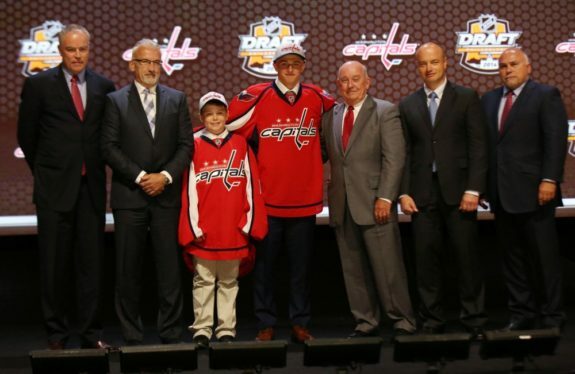 Prior to making his way onto the NHL scene, Vrana rose as one of the top overseas prospects. He put up outstanding numbers playing in the SuperElit league and the SHL, and in most of his campaigns, he would average nearly a point per game. Not only that, but he proved to be a skilled, offensive forward, a consistent scorer and a huge threat on the forecheck. The Czech winger became one of the top forwards available in the 2014 draft class, and the Capitals, who were coming off a rough season in which they did not qualify for the Stanley Cup Playoffs, didn’t pass on him. Newly-appointed general manager Brian MacLellan took the promising forward at 13th overall, citing the need for more depth on the wing. 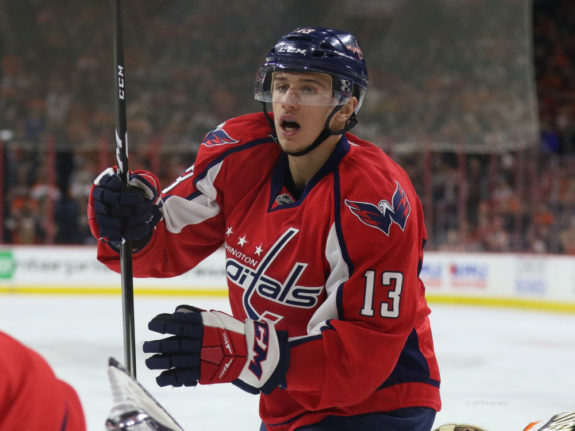 After an outstanding performance at the Capitals’ 2014 Development Camp at their practice facility in Ballston, in which he showcased a dart of a shot and some impressive shootout moves, Vrana signed a three-year, entry-level contract with Washington. From that point on, he has continued to grow and is now one of the organization’s most promising forwards. Looking at his skill set, his biggest asset is his shot. He has a fast release and a sneaky shot, as well as great vision and offensive instincts. He is also a fast skater and can keep up with the play and tune his game and speed to that of his teammates. Overall, he is projected to make an impact as a sniper and already shows upside as a possible top-six winger. Despite Vrana’s upside, skill and flashes of greatness, he has not been able to prove that he is ready for a full-time NHL gig. He did earn 21 games with the Capitals last season, but after posting just three goals and six points in that time period, Washington decided he would better benefit from time at the AHL level. In 49 games with the Bears this past year, he shined with 19 goals and 36 points, showcasing his ability to score and put up strong totals. However, coming into 2017-18, the Capitals do not have as much depth on their forward lines as next season. The team shipped Marcus Johansson off to the New Jersey Devils to clear cap space, and they also lost Justin Williams and Daniel Winnik to free agency (it should be noted that Winnik is still a free agent). So, there are a number of spots up for grabs, and instead of signing free agents, Washington will be relying on the pieces in the system to fill the voids on the roster. This is where Vrana will get the opportunity to move up as well as remain with the team for the entirety of the season. And considering his skill set, he is ready to slot in on the second line. However, though there are spots up for grabs, and nothing is guaranteed. Other AHLers and big-name prospects, like Nathan Walker, Riley Barber, and Liam O’Brien are expected to also make a run for spots at the NHL level. And though Vrana is skilled, all of these players have similar experience and can outplay him, winning not only roster spots, but more ice time. So in the end, if the 6-foot, 195-pound winger wants to make an impact and that top-six spot this season, he will have to compete hard and shine brightly in training camp. This means being more consistent and making headlines right off the get-go, as well as putting up scoring totals in the preseason. Not only that, but he will have to work on his two-way game and be more disciplined on the ice. In addition, if he proves to have a lot of chemistry with Evgeny Kuznetsov and Andre Burakovsy, he will get the ice time he seeks. If he can do all of that, as well as show the Capitals he has what it takes to join the NHL ranks, Vrana is closing in on a spot on the opening night roster.